ROCKINGHAM, N.C. – Selma’s Taz Holliday II claimed the biggest share of the weekend purse and a father-son racing team claimed a rare double before Tropical Storm Alberto forced cancelation of the final day of racing in the 20th annual “Big John” Leviner Memorial Bracket Championships at Rockingham Dragway. Holliday fought his way through nine rounds of Top ET competition on Sunday before breezing to a $10,000 payday when former Rockingham track champ Eric Aman of Clinton was .002 of a second too quick to react in the final. Holliday’s big payday notwithstanding, it was a banner weekend for the Westville, S.C., team of James Freeman and son Ross, both of whom reached the winners’ circle. James Freeman beat Fayetteville’s Kyle Davis to win Top ET on Saturday before his 19-year-old son prevailed on Sunday in Footbrake. Nevertheless, James will go home with bragging rights since he enhanced his victory by winning Saturday’s Run for the Wally while Ross came up short in his bid for one of the iconic NHRA trophies on Sunday when he dropped a one-run, winner-takes-the-Wally duel with Holliday. The weekend’s fourth big winner was Rockingham veteran Art Laselle who drove his 1991 Dodge Daytona to Footbrake honors on Saturday when Sanford’s Kevin Locklear was guilty of a final round foul start. Saturday’s Gamblers Race winners were Clarkton’s Allen Britt, who drove E.J. Womack’s dragster past the Chevy S-10 of Womack in the Top ET final and Roxboro’s Chris Dixon, who prevailed in Footbrake. Bud Tramwell won the Jr Dragster Gamblers race. Because of the rush to beat the weather, the Run for the Wally in the Jr. Dragster class was postponed. The winner will be determined in a runoff between Hayden Dial of Rowland, Connor Caulder of St. Pauls, Lane Morgan of Angier and Cale Pittman of Selma during The Rock’s Hoosier Tires Carolina Coalition event in September. 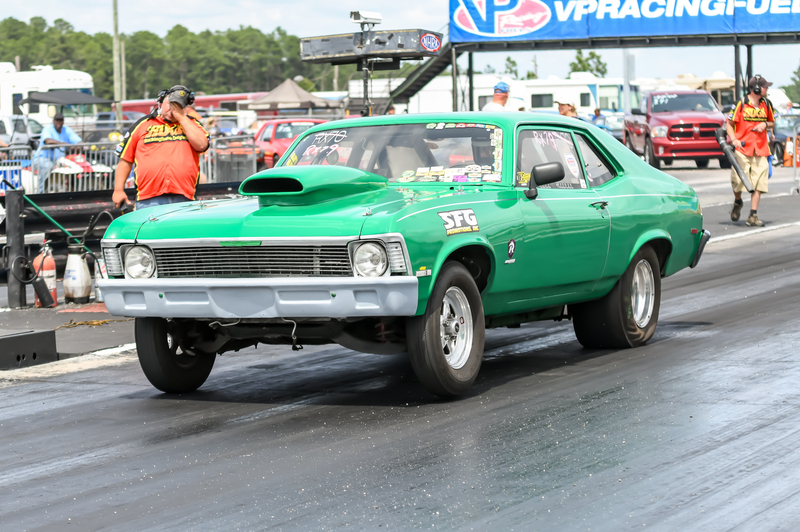 Round 5 – Derrek Thompson, White Sulpher Spring, 1973 Chevy Vega, .010, 5.933 on a 5.890, 115.81 mph, def. Brian Phillips, Bellows Creek, .042, 6.252 breakout on a 6.280, 109.56 mph; Taz Holliday II, Selma, .027, 4.664 on a 4.650, 144.27 mph, def. Tim Douglas, Wytheville, Va., 1989 Chevy Camaro, .024, 6.192 on a 6.170, 108.35 mph; Eric Aman, Clinton, 1986 Ford Mustang, .011, 5.822 on a 5.810, 114.29 mph, def. Jerrett Creech, Selma, 1968 Chevy Camaro, .041, 5.840 on a 5.830, 117.81 mph; Paul Warwick, Raeford,.022, 6.455 on a 6.450, 103.28 mph, def. Chris Dean, Sanford, .019, 5.606 on a 5.550, 123.06 mph; Terry Rucker, Benson, .000, 6.274 on a 6.260, 101.33 mph, def. Kyle Davis, Clayton, .042, 5.330 on a 5.310, 130.75 mph; Michael Paschal, Pleasant Garden, .033, 4.685 on a 4.670, 147i.05 mph, def. Ron Thompson, NA, .008, 6.762 breakout on a 6.780, 102.46 mph; E.J. Womack, Lillington, .018, 6.356 on a 6.350, 108.67 mph, def. Lauren Freer, Mooresville, .023, 4.448 breakout on a 4.450, 155.96 mph; Robert Vogler III, Lewisville, .022, 4.465 on a 4.490, 155.27 mph, def. Harold Bell Jr., Shannon, foul (.001); Derrek Thompson #2, White Sulpher Spring, 1973 Chevy Vega, .011, 5.892 on a 5.900, 114.30 mph, def. Chad Brewer, Shannon, .006, 5.349 breakout on a 5.370, 131.46 mph; Taz Holliday #2, Selma, bye. Round 6 – Holliday, .009, 4.671 on a 4.650, 144.95 mph, def. Thompson #2, .022, 5.876 breakout on a 5.880, 115.66 mph; Aman, .022, 5.799 on a 5.800, 113.40 mph, def. Womack, .059, 6.339 breakout on a 6.350, 108.35 mph; Vogler, .003, 4.472 on a 4.460, 154.78 mph, def. Paschal, foul (.001); Warwick, .016, 6.443 on a 6.440, 103.67 mph, def. Thompson #1, .018, 5.887 on a 5.880, 114.27 mph; Holliday, .002, 4.664 on a 4.650, 141.24 mph, def. Rucker, .037, 6.221 breakout on a 6.230, 109.50 mph. Round 7 – Aman, .003, 5.781 on a 5.780, 117.70 mph, def. Holliday #2, .003, 4.659 on a 4.650, 144.61 mph; Vogler, bye; Holliday #1, .021, 4.869 on a 4.650, 114.51 mph, def. Warwick, foul. Semifinals – Aman, bye; Holliday, .017, 4.663 on a 4.660, 145.45 mph, def. Vogler, .013, 4.495 on a 4.470, 153.72 mph. FINAL – Taz Holliday II, Selma, .015, 4.976, 109.70 mph, def. Eric Aman, Clinton, foul (.002). Round 5 – James Freeman, Westville, S.C., .006, 5.766 on a 5.770, 118.22 mph, def. Chris Dixon, Roxboro, 1967 Chevy II, .013, 6.774 breakout on a 6.780, 99.31 mph; Jerry Brewer, Lumberton, .047, 4.718 on a 4.700, 144.63 mph, def. Justin Boyer, Moncks Corner, S.C., 1985 Ford Mustang, .023, 6.077 breakout on a 6.080, 112.10 mph; Ron Phipps, Salisbury, .045, 6.273 on a 6.250, 107.76 mph, def. Andrew Davis, Fayetteville, .094, 6.311 on a 6.310, 107.81 mph; Will Cauthen, Lancaster, S.C., .033, 4.671 on a 4.670, 147.62 mph, def. Scott Lewis, Four Oaks, foul; Richard Dukes, Augusta, Ga., 1970 Chevy Nova, .013, 5.531 on a 5.480, 121.83 mph, def. Don White, Cordesville, S.C., .026, 6.031 on a 5.990, 112.76 mph; Kyle Davis, Clayton, .058, 5.325 on a 5.320, 127.16 mph, def. Lee Desist, Fayetteville, .014, 6.258 breakout on a 6.260, 108.19 mph; Michael Smith, Riegelwood, .011, 5.449 on a 5.430, 125.60 nph, def. Robby Stewart, NA, .050, 5.188 on a 5.180, 130.51 mph; Noah Johnson, Fayetteville, .013, 4.854 on a 4.820, 137.57 mph, def. Harold Bell Jr., Shannon, .031, 5.459 on a 5.410, 117.77 mph; David Lowe, Rowlands, bye. Round 6 – Phipps, .011, 6.254 on a 6.240, 110.14 mph, def. Brewer, .016, 4.719 on a 4.700, 145.89 mph; Davis, .016, 5.351 on a 5.320, 126.46 mph, def. Lowe, .126, 4.764 breakout on a 4.780, 113.82 mph; Dukes, .020, 5.523 on a 5.510, 121.51 mph, def. Johnson, .029, 4.838 on a 4.830, 95.92 mph; Cauthen, NA, 4.676 on a 4.670, 146.53 mph, def. Smith, foul; Freeman, bye. Round 7 – Phipps, bye; Freeman, .004, 5.780 on a 5.770, 118.28 mph, def. Cauthen, .032, 4.678 on a 4.670, 147.86 mph; Davis, .017, 5.310 on a 5.320, 130.28 mph, def. Dukes, foul. Semifinals – Freeman, .011, 5.771 on a 5.770, 115.83 mph, def. Phipps, .013, 6.242 on a 6.220, 110.38 mph; Davis, bye. FINAL – James Freeman, Westville, S.C., .010, 5.779 on a 5.760, 119.63 mph, def. Kyle Davis, Clayton, .002, 5.347 on a 5.310, 123.01 mph. 6.600, 104.35 mph; Lauren Edwards, Mayesville, 1970 Chevy Nova, .015, 6.592 on a 6.570, 103.34 mph, def. Trey Sikes, Hamlet, Dodge Omni, foul; Robbie Draughon #2, Cumberland, 1969 Chevy Camaro, .062, 6.415 on a 6.420, 97.72 mph, def. Leonard Cherry, Mt. Olive, 1985 Chevy Camaro, .118, 8.814 breakout on an 8.850, 77.49 mph. Round 6 – Freeman, .023, 7.160 on a 7.150, 98.26 mph, def. Johnson, .045, 6.480 breakout on a 6.490, 103.17 mph; Sides, .000, 6.935 on a 6.920, 97.40 mph, def. Brock, .006, 7.008 on a 6.990, 91.39 mph; Draughon, .032, 6.464 on a 6.420, 93.95 mph, def. Hoffman, .047, 7.575 on a 7.480, 83.00 mph; Bullock, .013, 6.269 on a 6.260, 108.88 mph, def. Yates, .011, 6.380 breakout on a 6.390, 107.85 mph; Edwards, .012, 6.585 on a 6.580, 103.22 mph, def. Welch, .009, 5.933 on a 5.920, 115.65 mph. Round 7 – Freeman, .056, 7.165 on a 7.150, 98.16 mph, def. Bullock, .065, 6.251 breakout on a 6.260, 107.70 mph; Edwards, .072, 6.582 on a 6.570, 103.28 mph, def. Draughon, foul; Sides, bye. Semifinals – Sides, .014, 6.959 on a 6.930, 97.50 mph, def. Edwards, .027, 6.563 breakout on a 6.570, 103.68 mph; Freeman, bye. 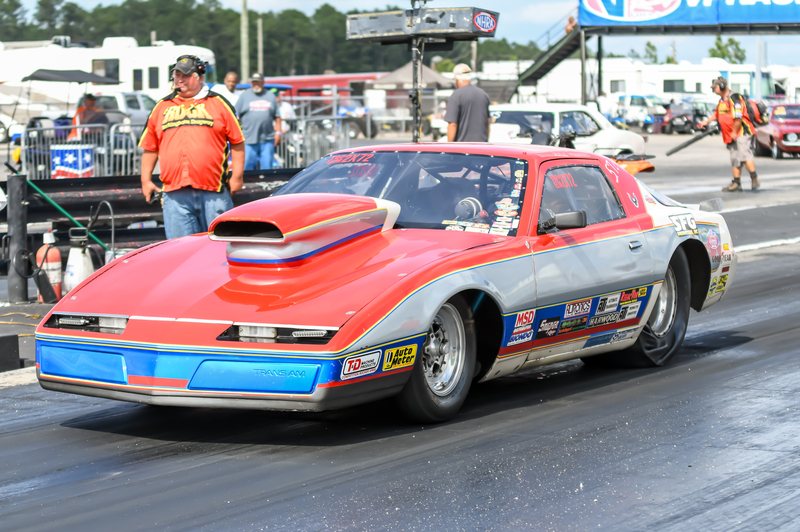 FINAL – Ross Freeman, Westville, S.C., 1979 Chevy Camaro, .031, 7.193 on a 7.160, 98.05 mph, def. Steve Sides, Fayetteville, 1979 Chevy Camaro, foul. Round 5 – Mark Soles, Delco, .007, 5.662 on a 5.650, 115.84 mph, def. Brandon Church, Trinity, 1995 Ford Mustang, .011, 8.522 on an 8.510, 80.24 mph; Jamie Carroll, Clayton, 1971 Chevy Nova, .034, 6.616 on a 6.590, 101.22 mph, def. Chris Brewington, Clinton, .065, 7.273 breakout on a 7.280, 94.98 mph; Kevin Locklear, Sanford, 1971 Plymouth Duster, .032, 6.577 on a 6.540, 100.05 mph, def. Tim Davis, Fayetteville, .046, 7.939 breakout on a 7.950, 85.57 mph; Chris “Hotrod” Gibson, Lexington, 1971 Chevy Camaro, .041, 6.285 on a 6.280, 108.37 mph, def. Robbie Draughon, Cumberland, 1969 Chevy Camaro, .032, 6.447 on a 6.420, 101.58 mph; Edward Freeman, Kershaw, S.C., 1968 Chevy Chevelle, .041, 6.946 on a 6.930, 97.58 mph, def. Davis Sears, Holly Springs, .041, 6.128 on a 6.090, 106.42 mph; Art Laselle, Fayetteville, 1991 Dodge Daytona, .057, 5.645 on a 5.650, 122.14 mph, def. Scott Yates, Gold Hill, 1965 Ford Mustang, foul; John Combs Jr., Bladenboro, .074, 6.225 on a 6.220, 109.71 mph, def. Tim Davis #2, Fayetteville, .030, 7.940 breakout on a 7.950, 82.30 mph. Round 6 – Soles, bye; Gibson, .023, 6.331 on a 6.280, 104.84 mph, def. Freeman, .057, 6.980 on a 6.930, 105.48 mph; Locklear, .036, 6.540 on a 6.570, 101.44 mph, def. Combs, foul; Laselle, .004, 5.680 on a 5.640, 116.48 mph, def. Carroll, .051, 6.601 on a 6.590, 92.71 mph. Semifinals – Laselle, no time, def. Soles; Locklear, .043, 6.542 on a 6.550, 99.99 mph, def. Gibson, .048, 6.253 breakout on a 6.270, 108.59 mph. 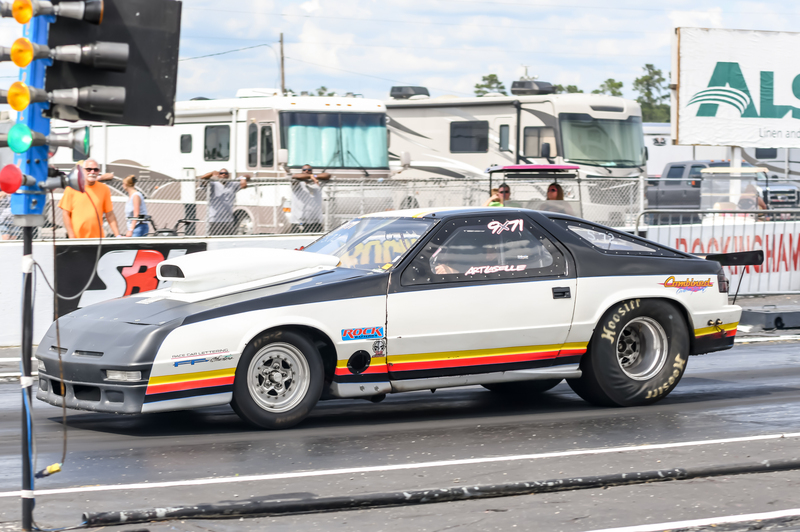 FINAL – Art Laselle, Fayetteville, 1991 Dodge Daytona, .028, 5.645 on a 5.640, 121.22 mph, def. Kevin Locklear, Sanford, 1971 Plymouth Duster, foul. Round 4 – Cale Pittman, Selman, .036, 8.810 on an 8.770, 71.23 mph, def. Alyssa Rabon, Florence, S.C., .038, 11.856 on an 11.760, 53.68 mph; Brad Johnson, Orangeburg, S.C., .059, 7.961 on a 7.930, 82.80 mph, def. Logan Westmoreland, Greenwood, S.C., foul; Chase Carter, Hampsted, .087, 8.013 on a 7.940, 80.91 mph, def. Joshua Talvecchio, Ernal, foul; Hayden Dial, Rowland, .105, 8.016 on a 7.900, 79.13 mph, def. Shelby White, Cordesville, S.C., .193, 8.208 on an 8.160, 78.40 mph; Brandon Sullivan, Radford, Va., .000, 7.944 on a 7.940, 77.92 mph, def. Morgan Carroll, Olar, S.C., .043, 8.476 on an 8.450, 75.60 mph; Danielle Snuffer, Mt. Holly, bye. Round 5 – Pittman, .073, 8.792 on an 8.780, 73.18 mph, def. Carter, .096, 8.002 on a 7.980, 81.06 mph; Dial, .013, 7.936 on a 7.960, 81.57 mph, def. Sullivan, foul; Snuffer, .074, 7.887 on a 7.900, 80.89 mph, def. Johnson, .075, 7.954 breakout on a 7.970, 82.12 mph. 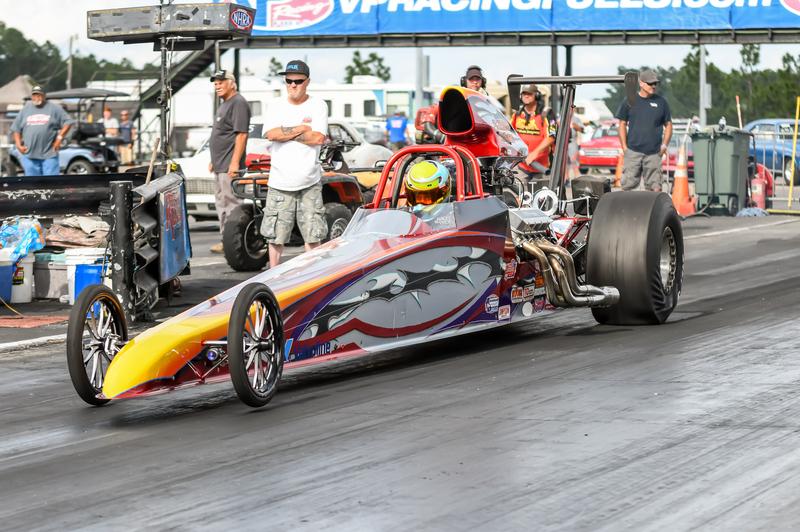 Semifinals – Pittman, .011, 8.766 on an 8.780, 74.27 mph, def. Snuffer, .061, 7.857 breakout on a 7.900, 81.60 mph; Dial, bye. FINAL – Hayden Dial, Rowland, .083, 7.913 on a 7.900, 81.55 mph, def. Cale Pittman, Selma, foul. Round 4 – Bladen Clint, Benson, no time, no speed, def. Budd Trammell II, Aynor, S.C., .137, 8.857 breakout on a 8.930, 72.74 mph; Connor Caulder, St. Pauls, .035, 7.925 on a 7.900, 78.22 mph, def. Thomas Davis, Smithfield, .021, 7.917 breakout on a 7.950, 80.80 mph; Kimberly Messer, Four Oaks, .046, 7.899 on a 7.930, 83.07 mph, def. Hayden Dial, Rowland, foul (.002); Marissa Bickford, Concord, .117, 7.898 on a 7.900, 81.78 mph, def. 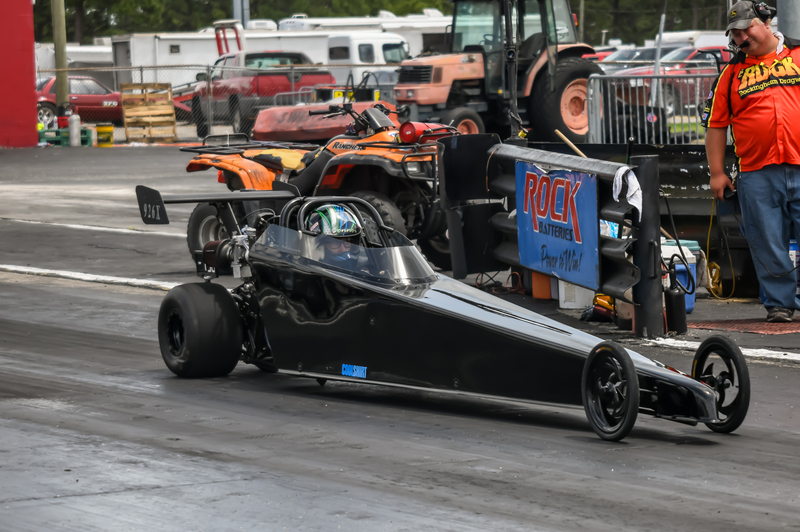 Shelby White, Cordesville, S.C., foul; Lane Morgan, Angier, .010, 8.944 on an 8.960, 73.52 mph, def. Makala Stevens, Lexington, S.C., .082, 7.860 breakout on a 7.900, 81.81 mph. Round 5 – Bickford, .007, 7.952 on a 7.900, 79.49 mph, def. Messer, .048, 7.940 on a 7.900, 81.28 mph; Caulder, .003, 7.887 on a 7.900, 83.23 mph, def. Clint, foul; Morgan, bye. Semifinals – Morgan, .010, 8.961 on an 8.940, 73.13 mph, def. Bickford, .026, 7.931 on a 7.900, 78.75 mph; Caulder, bye. FINAL – Connor Caulder, St. Pauls, .013, 7.919 on a 7.900, 80.22 mph, def. Lane Morgan, Angier, .045, 8.967 on an 8.950, 73.00 mph.